To reduce operating expenses by $35 million this year, MIT will be taking measures that will include freezing employee salaries, closing the campus during part of winter break, and cutting up to 250 jobs, said Provost Robert A. Brown. 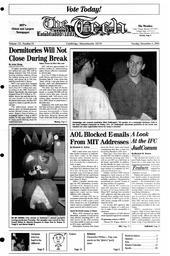 America Online blocked all e-mail from MIT addresses from Oct. 16 to Oct. 20 because AOL e-mail accounts were receiving too much spam from MIT servers, said former Vice President for Information Systems James D. Bruce. The decision last month to suspend Delta Kappa Epsilon from its house for a year marks the most severe punishment imposed by students on a fraternity in years.